is, on speculation, i.e., I hoped a magazine might like a cartoon well enough to buy it). Several things bother me, however: 1) the drawing looks stiff and labored 2) the waiter’s legs, which I hid behind the table, are too short 3) the drawing has no depth because there’s no shading 4) it also looks static because there’s very little variation in line thickness 5) my signature’s too big and obvious, the sure sign of an amateur who is worried about getting credit. It’s a bit sloppy, but it has more energy. The thick and thin lines give it some “pop.” The grayscale shading (added in Photoshop) mimics a tradition ink wash and adds some tone. The lines are more supple and assured. I inked it quickly and didn’t worry about following my rough pencil lines precisely. The proportions look good. The frogs are bigger than they would be in real life, but that’s OK– it’s a difference that doesn’t really register, and they need to be seen and recognized as frogs. My signature is not competing for the reader’s attention. But I’m asking myself: how clear is the joke? What exactly is the joke?? My original thought: a princess is marrying a frog; two frogs show up at the church where an usher is seating guests; the frogs tell the usher they’re “friends of the groom,” like it was the most natural thing in the world. It’s a funny gag if you share my frame of reference– but have I given the reader have enough information to infer what I was thinking? The church setting seems clear, and the man is wearing wedding attire, complete with tails, cummerbund, and boutonniere. But if I had to do over, I’d include king and queen characters (wearing crowns) behind the frogs, looking down at them with disapproval. I think that would better communicate the idea of a “mixed marriage,” and help the reader get the joke. What do you think? Is a cartoon funnier if it looks spontaneous and dashed-off? Did either of these cartoons make you laugh? Do we need more frog cartoons, or are you ready to support a ban on them?? Hope you’ll leave a comment. Look Out, Supe– That’s Taxregonite!! I got the “Two for the groom.” joke immediately. But then again, my blog is about all of the morons out there, so I’m not sure if I answered that question conclusively for you. It is fun to see the evolution of your style, very nice! Both illustrations made me laugh and I “got them”. Both funny and so cool to see how your drawings have evolved. I only knew the enlightened you so it’s fun to see what’s changed. And I got both jokes, but really loved the simplicity of the second one as it stood. Even the dogs got a kick out of it! As usual, Tracey, your kindness and support are off the scale. Good to have your feedback, especially on that second cartoon. Perhaps the lesson for me is: trust your instincts, don’t over-think an idea. Somewhere in the Canon, Sherlock Holmes says that the true mark of an artist is knowing when to stop. He was right, as always. Hey Mark, I liked both cartoons, but you’re right the second looks much more spontaneous and the wash effect compliments it very well. After forty years of drawing, my sketches are far superior to my final product–a problem of being selftaught and having a Type A personality. Thanks for the laugh, the kind words, and for stopping by– all sincerely appreciated. For the top one, it’s never too late to add shadows, a small parcel label around your signature and some steps coming up from the cellar, for the waiter (he’s not got to the top step yet and the table’s too close to it! For the second, I’d have a before and after pic, and in the second have a pic of the bride and groom. Good to see some evolution of your style. I’d never have thought of varying the thin/thickness of the lines. All my artwork from years ago lacked shadow. I didn’t know how to do shadow and didn’t understand about tonality until I started using Photoshop and could experiment and then use the undo button. That freed me up to paint and draw properly, so in a way (a big way) Photoshop and digital art helped my ‘real media’ art. I was really struck by what you said re Photoshop and the Undo button as a liberating force. I could say exactly the same. I’ve had the same thought many times, but your comment was the first time I’d ever heard it expressed. Ink washes for me were a disaster– totally unforgiving. I experimented with cross-hatching, but often made a hash of that as well. Digital media has given us all much greater freedom to fail. Perhaps some of us need that more than others. It was certainly something I needed. Good to see you, thanks for a very striking insight. 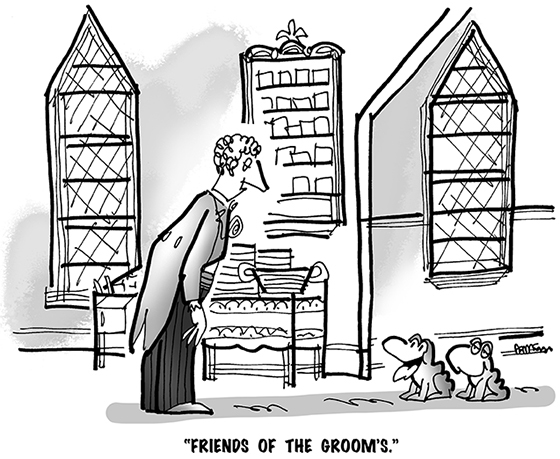 Yes, I got the two grooms joke and I laughed. I do like the idea of the king and queen characters (wearing crowns) behind the frogs, looking down at them with disapproval. Thanks as always for your kindness and support. Whoa!! What an ego-boosting comment!! I’m going to get out my special digital scissors and snip it out of my monitor so I can hang it on my wall!! They both made me laugh! I didn’t see any of the problems you had mentioned. Funny… artists are their own worst critic. I think you should submit the first cartoon again… a fresh pair of eyes would appreciate it I think! Thanks as always for your cheerful support!! Thanks as always for your rollicking fine support! Certainly your 2nd cartoon looks more “natural” and confident plus complex in line texture than the lst one. I didn’t get the 2nd one when I first saw it. Maybe if there was a bubble over the groom’s head of his private thought about this duo of frogs, it might be clearer to all readers. Very glad to have your feedback, and you’re certainly not the only one who was a bit puzzled by the second cartoon. Humor is a mysterious concept, and so is human perception. (How’s that for a couple of whopping understatements??) It’s good for someone like me to get feedback on cartoons and illustrations, and try to decide if I’ve given readers enough visual cues without giving everything away. It’s a challenge trying to find the right balance. Always good to see you, Jean, thanks so much for your comment. I absolutely loved the second one! You know what’s funny, it was one of those rare moments where I didn’t get the joke right away yet it had, as you said, great energy and I laughed right away. Kind of like Tom Hanks or Will Ferrell. They’re hysterical even when they’re just standing around. Ha! Thanks, Amelie, what a very kind comment, that’ll keep me going for awhile. Interesting– I’ve noticed many times that great energy on stage can salvage a weak song or joke, but hadn’t really thought about the extent to which a funny drawing might help offset an ambiguous gag. Hey, good to know it can happen!! 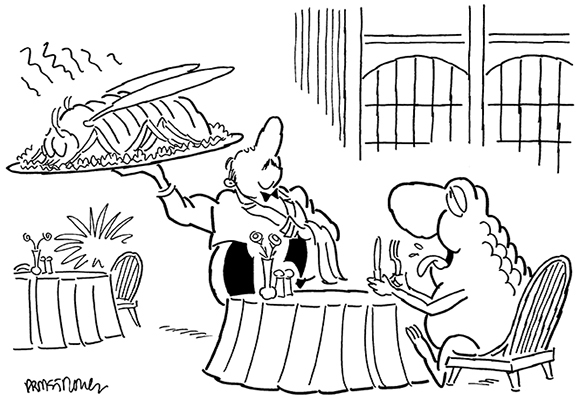 There can never be too many frog cartoons – they are so ribbetting. What a journey, Mark! 20 years! WOW! Congrats to you! I didn’t get the joke for the second one, but the first one made me laugh! Many thanks for all your good cheer and support!